Buy any of these books at Amazon.com . Kicking and Screaming to Enlightenment, A Journey to the Real Self. Mary Bell, Wheatmark Publishing, 2010. View more information about Kicking and Screaming to Enlightenment here. and visit Amazon or Barnes and Noble to order. What is Enlightenment?, A periodical published twice a year, available at bookstores. Founded by Andrew Cohen . It is excellent and thoughtful reading! The Four Agreements, Don Miguel Ruiz, Amber-Allen Publishing, 1997. Ancient knowledge from the Toltec tradition, which honors all the spiritual masters who have taught on earth. Very practical suggestions for achieving consciousness. The Marriage of Spirit, Leslie Temple-Thurston, Corelight Publications, 2000. In this book, Leslie describes how to consciously transcend the upward and downward spiral of duality in order to move into Unity, which exists is another paradigm of reality. This is very helpful information for anyone going through this process. The Power of Now, Eckhart Towle, New World Library, 1999. Probably one of the best written books ever on spiritual enlightenment! It contains a transmission of energy in the writing so that you receive it as you read. The Secret of the Shadow, Debbie Ford, HarperSanFrancisco, 1993. This is a beautiful description of the deepest secret within our shadow, our Real Selves. Debbie describes how identifying with the dramas in our lives prevents us from knowing the truth of who we are. By embracing and understanding them, we can return home to our Divine essence. **You Are That!, Satsang with Gangaji, volumes I&II, Satsang Press, 1995,1996. In these books, Gangaji, transmits the truth of her lineage that transcends religion or spiritual tradition, the recognition of the true Self. She leads you to directly experience That which you are. When Things Fall Apart, Pema Chadron, Shambhala Publications Inc., 1997.Wisdom from an American Buddhist nun and renowned meditation master on dealing with difficult times. Another description of how being present transcends fear. Very apropos for our current times. The Biology of Transendence by Joseph Chilton Pearce, Park Street Press, 2002 This is the missing link in the discussion of enlightenment. From our biology,we are quite literally made to transend this state of being. However, it is the breakdown of the interaction between our head and our heart that is dictated by society and religion that keeps us where we are. But we are not doomed because we are built to transcend. The Sacred Mirror, by John Prendergast, Peter Fenner, and Sheila Krystal, Paragon House, 2003. This book is a group of essays by well known therapists that combines the wisdom of Eastern spiritual tradition and Western Psychotherapy. Becoming the sacred mirror of your client’s non-dual nature allows a depth of healing not possible with other levels of healing. An experience rather than a method, this is groundbreaking work! Zero Limits, by Joe Vitale 2007, Hypnotic Marketing., Teaming up with Dr. Ihaleakala Hew Len, master teacher of modern Ho’oponopono, these two teachers walk you through the system, helping you clear your mind of subconscious blocks so that destiny and desire can take over and help you get what you truly want from life. A very spiritual approach to a very practical problem. Kabbalistic Healing, by Jason Shulman, Inner Traditions 2004. Written by one of my former teachers, Jason Shulman is world renowned in his understanding and teaching of the Kabbala. “This is a must-read for anyone who wishes to learn the essence of kabbalistic teachings in the hands of a master of spiritual and psychological development.” Rabbi David A. Cooper, author of God is a Verb. The Essential Ken Wilber, An Introductory Reader, An Introductory Reader by Shambhala Publications, Inc. 1998. Although Ken Wilber’s books can be quite deep and difficult to understand, I have chosen this primer because it summarizes much of what I work with and clarifies some of the misunderstood concepts such as unity consciousness and the ego. I will be using it in both my on-line class and my seminars. The Mayan Calandar and the Transformation of Consciousness, by Carl Johan Calleman, PHD, Bear & Company, 2004 This is an in-depth philosophical investigation and interpretation of the Mayan Calendar offering a genuinely holistic and global understanding of ourselves. Calleman’s perception of the two critical Venus passages that occur on June 4, 2004 and June6, 2012 are for a “final transformation of the human mind into a mind of light.” He describes June 1st-2nd 2005 as a major transitional point in that passage. See his website at www.calleman.com. for more information. The Diamond in Your Pocket, Discovering Your Inner Radiance by Gangaji, This first widely-distributed book from beloved American-born teacher Gangaji points us directly to the diamond of truth that we really are. Written as a series of short contemplations, The Diamond in Your Pocket shows how it is effortlessly possible, regardless of circumstance, to stop the endless activity of your mind and directly experience the perfect radiance of who you really are. Available in Bookstores everywhere in the United States. THE THIRD JESUS: THE CHRIST WE CAN NOT IGNORE, by Deepak Chopra Harmony Books, a division of Random House 2008 First, there is the historical Jesus, the man who lived more than two thousand years ago and whose teachings are the foundation of Christian theology and thought. Next there is Jesus the Son of God, who has come to embody an institutional religion with specific dogma, a priesthood, and devout believers. And finally, there is the third Jesus, the cosmic Christ, the spiritual guide whose teaching embraces all humanity, not just the church built in his name. He speaks to the individual who wants to find God as a personal experience, to attain what some might call grace, or God-consciousness, or enlightenment. The Death of Religion and the Rebirth of Spirit, by Joseph Chilton Pierce Inner Traditions International 2007 Pearce explains that, beneath our awareness, our culture imprints a negative force-field that blocks the natural rise of our spirit toward our true, innate nature of love and altruism. Further, he identifies religion as the primary cultural force behind this negative imprinting. Drawing from recent neuroscience, neurocardiology, cultural anthropology, and brain development research, Pearce explains that the key to reversing this trend can be found in the interaction between infants and adults. The adult mind-set effectively compromises the infant’s neural and hormonal interactions between the heart and the higher evolutionary structures of the developing brain, thus keeping us centered primarily in our most primitive and defensive neural foundations, generation after generation. Pearce shows us that if we allow the intelligence of the heart to take hold and flourish, we can reverse this unconscious loss of our true nature. Living Gnosis, A Practical Guide to Gnostic Christianity by Tau Malachi Llewellyn Publishing ,2005. Angels Don’t Play This Haarp, Dr. Nick Begich & Jean Manning, Earthpulse Press, 1995. Awakening to Zero Point, the Collective Initiation,Gregg Braden BraunBrumfield Inc., 1993. Catastrophobia, Barbara Hand Clow, Bear & Co., 2001. This latest book explores the idea of cataclysm as something that has already happened, rather than something to fear in the future. Very technically written, somewhat difficult reading, but worth it! Chiron and the Healing Journey, Penguin Books, 1989. Conscious Evolution, Barbara Marx Hubbard, New World Library, 1998. Dancing the Dream, The Seven Sacred Paths of Human Transformation, Jamie Sams, Harper SanFrancisco, 1998. An excellent book that describes the process of transformation through the initiation process from the native American perspective. Emergence: The shift from Ego to Essence, Barbara Marx Hubbard, The Foundation for Conscious Evolution, 2002. Hands of Light, Barbara Brennan, Pleiades Books, 1987. Light Emerging, Bantam Books, 1993. Many Are Called, Few Are Chosen, Dr. Heather Harder, Light Publishing, Crown Point, IN., 1994. Something in this Book is True, Bob Frissel, Frog, Ltd. 1997. Soul Retrieval, Sandra Ingerman, HaprerSanfrancisco, 1990. Still Here, by Ram Das, Riverhead Books, 2000. Inspiration about the process of conscious dying whether dropping the body or not. His helpful insights can be applied to what many are experiencing as they “die” to the little ego in the process of enlightenment. 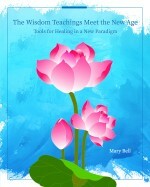 The Ancient Secret of the Flower of Life, vol. 1 and 2, Drunvalo Melchizedek, Light Technology Publishing, 2000. The Dark Side of the Light Chasers, Penguin Putnam, Inc. 1998. **The Diamond Light, Djwhal Khul channeled through Violet Starre, Light Technology Publishing, 2000. An updated version of the wisdom channeled through Alice Bailey in simplified language and revised to explain what is happening now. Excellent! The Light Inside the Dark, John Tarrant, Harper Collins Publishers, 1998. The Life You Were Born to Live, Dan Millman, An H J Kramer Book, 1993. Understanding your life purpose through numerology. This is one of the best books I have found using this discipline. The Lost Teachings of Atlantis, by Jon Peniel, Network Publications, 1997. A wonderful book, written by a Tibetan monk about the process of enlightenment. Well written and humorous at times, it explains the teachings that were held until now from the lineage of Atlantis , through a group of monks who lived in a hidden monastery in Tibet. Easy and fascinating reading! The Occult Christ, Ted Andrews, Liewellyn Publications, 1993. The Path of the Mother, by Savitril L. Bess, Ballantine Wellspring, 2000. The personal story of a devotee of the Hindu mystic Ammachi, and her six stage journey to union with the Great Mother. Inspiring! The Revelation- Our Crisis is a Birth- The Book of Co-Creation, Barbara Marx Hubbard, The Foundation for Conscious Evolution, 1993. The Woman with the Alabaster Jar, Margaret Starbird, Bear & Co. 1993. Walking Between the Worlds, Gregg Braden, Radio Bookstore Press, 1997.